A fresh water lake provides the opportunity to partake in many different types of activities including boating, fishing, tubing, bird watching, and more. Lakes are also an excellent habitat for aquatic plans, fish, birds and other wildlife. If you own lakeside property, you probably know that their soft bottoms offer shoreline protection from waves and ice persistence. However, what happens when a major storm is being forecasted? A good precaution to take when a major storm is expected to hit your lake property is to pull your dock out of the water. For some boat owners, this is impossible, and many docks get damaged as a result of major storms. However, V-Dock products make it possible. One of our very popular docks, the Roll-In Dock, uses advanced technology through a unique V-beam support and connecting pins to make installation and removal a breeze while providing quality stability. 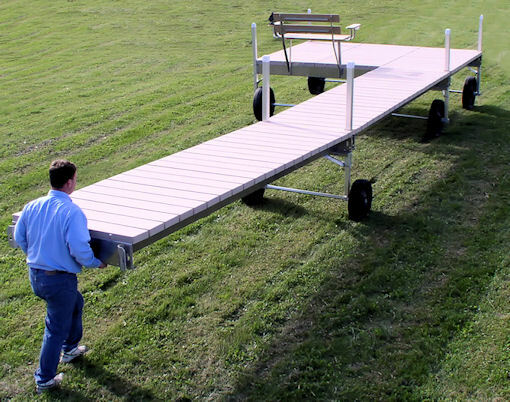 Check out this video of two people installing 86 feet of portable dock in under 30 seconds. You’ll have a choice of either walking the dock into position or using a vehicle with a tow-bar to do it. Adjustments are made from the top of the deck, so you won’t get wet. The Roll-In Dock works best for shallow, freshwater lakes and their durable wheels are a great match against mucky bottoms. Though Post Sectional Docks parallel older docks in some aspects, such as needing to assemble them in the water, ours are lighter, easier to install, and aesthetically pleasing. As opposed to lifting the dock off the post with a sleeve, posts can be effortlessly installed and removed from the side. This is an excellent option to benefit from luxury features without breaking the bank. Post Sectional Docks are ideal for extremely steep or small shorelines. Our Roll-n-Float System is an upgraded post sectional dock that one person can easily install without getting into deep water. The float pieces simply attach into the end of the dock, roll across the shore, and move out into the water. This dock is ideal for freshwater lakes since where the water or muck is too deep or too cold for walking. Our modern docks can be easily installed and removed in at news of an approaching storm. Questions? Call V-Dock at 651-464-3902. We have over 37 years of experience in providing you and your family with the very best in boat docks.